Maria Trinidad Santos hugs a pink blanket around her shoulders in a surgical waiting room in Antigua, Guatemala. It is 6 a.m. – the time the doctors told her to arrive – but the doors to the operating room are dark. Patients line the walls like the tire spokes of the chicken buses that brought them there. Four quetzales one way. She pulls her silver earrings off and hands them to her daughter. After today, she knows she won’t be able to work for three months. After today, her 16-year wait for a 40-minute hernia surgery will be over. After today, her life could change. Maybe her hardships started in 1980, the year guerillas dragged her husband, the mayor of San Antonio Aguas Calientes, out of his office and murdered him. Villagers found his body two days later. Santos was widowed with four children at her heels. Maybe they started in 1994, the year her drunken son brought a rifle to his head in front of the family and fired, killing himself. Or maybe they started 16 years ago, when, after years of carrying crops, hoes and firewood on her back, she developed a hernia just above her left thigh. In 2016, Santos’s friend told her about a hospital she could afford in Antigua, about 20 minutes from her home. Santos represents one of more than 15 million Guatemalans sharing a national, government-funded health care system with less than one bed per 1,000 people, according to the 2016 CIA Factbook. Almost 60 percent of those Guatemalans live below the poverty line, defined as “the amount needed to purchase a basic basket of food,” according to The World Bank. Patients at state hospitals may wait months or years for surgery and are often required to provide their own medical supplies, such as gauze, plaster and medication. But at Obras Sociales del Santo Hermano Pedro, things are different. MARIA TRINIDAD SANTOS STIRS HER FOOD OVER THE FIRE IN HER HOME. SANTOS SOLD FOOD IN THE VILLAGE UNTIL 10 P.M.
“It’s like a donation, not a payment,” Julissa Pineda said, leaning back in a red armchair in her office at the hospital. Pineda, surgical unit chief at Obras since 2015, manages the surgery rooms, post-operation rooms and coordinates medical mission teams that come to the hospital for about one week per year to perform surgeries. Most teams come from the United States. In 2015, the hospital performed 4,253 surgeries in its five operating rooms, each the size of a basic college dorm room. After being referred for surgery by a doctor, social workers give patients an economic analysis. The social worker makes sure patients only need to pay what they can. Almost all hospital funding comes from donations and the medical mission teams themselves. Pineda believes Obras, a private hospital, provides what the national health care system cannot: resources. “The [national] system isn’t really set up to be patient-centric,” said Shelly Darnall, director of surgery and referrals at Faith in Practice. Faith in Practice, an Antigua-based non-governmental organization, is responsible for 16 of the 40 traveling surgical teams that work at Obras each year. The NGO also operates a patient and family home, Casa de Fe, that serves as a free hostel for patients and their families while they stay in Antigua awaiting surgery. “[Having a hernia for 16 years] is exemplary of the lack of access,” Darnall said. One day before her scheduled surgery, 65-year-old Santos cuts carrots, celery and onions outside the wooden structure that houses her cooking fire and dishes. Although she moved in with her daughter and no longer lives alone, she cannot afford a stove and she’s worried inhaling the smoke from the cooking fire each day will make her sick. Nearby, chickens peck at the dirt from wire enclosures. A dented wheelbarrow sits empty behind her – the wheelbarrow her children bought a few years ago so Santos wouldn’t have to carry farm supplies on her back. But that was after the hernia. Tonight, she will work for the last time for three months. She sells food in the village, usually earning 90 quetzales, about $12, a day. If she doesn’t sell food for a few days, her daughter says, people will come knocking. Santos smiles and laughs as she works, but inside she is afraid. The social worker at the hospital told her she would need to pay 1,000 quetzales for medication after the surgery is over. Without work, she won’t have the money unless her children help her and they’re already paying for school supplies for their own children. Her seven-year-old grandson scrambles up a tree near the creek. Santos will work until 10 tonight. The operating room door swings open. Santos quickly grabs her X-rays, stands up and pulls her shoulders back. Within minutes, nurses nestle her into the pre-operation bed for OR#4 and stuff her clothes in a plastic bag by the bathroom door. She fears anesthesia and the needles – she has never had a surgery before. She prays. Outside, her two daughters wait. Years ago, Santos and her daughter Maxima broke apart when Maxima said it was Santos’ fault she and her siblings didn’t receive education. But now, Maxima says family issues must be set aside. SURGICAL PATIENTS LOOK TOWARD THE OPERATING ROOM DOORS AS A NURSE CALLS OUT THE NAME OF THE NEXT PATIENT. MARIA TRINIDAD SANTOS WAITED FOUR HOURS TO RECEIVE SURGERY JAN. 17. 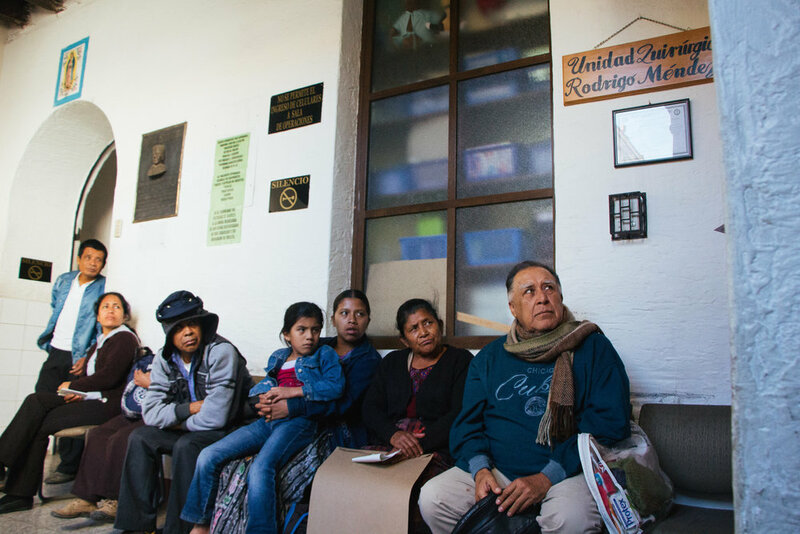 Darnall understands the fear many Guatemalans have of national hospitals. Many patients come to private hospitals like Obras with advanced diseases because they could never afford surgery elsewhere. Five days earlier in the very same pre-op bed Santos will use, Lidia Gomez dangled a yellow hat over her crying eight-month-old son, Hector. The front of her purple shirt was stained with wetness. She hadn’t fed her son since 2 a.m. because Hector would receive cleft lip surgery that day. Gomez, a 35-year-old housewife and mother of six, came to Obras after hearing about the hospital’s free services at a health stand in her village. She spent eight days waiting with her son next to an IV pole with a stuffed snowman hanging from it like a guardian cherub, more than six hours from her home in La Libertad. ALMOST TWO HOURS AFTER BEING ADMITTED, MARIA TRINIDAD SANTOS STEPS ONTO THE SURGICAL BED IN OR#4. SANTOS HAD HER HERNIA FOR 16 YEARS BEFORE RECEIVING SURGERY. “He is tired and bored,” she said, trying to comfort her son, and said she is tired of waiting. But when the doctor came to take Hector to his surgery, Gomez collapsed into tears. The nurses shuffled her out of the hospital, where she waited until the surgery was done. It was the last time Gomez would see her son with his cleft lip. Inside the pre-op room, babies screamed while nurses blew bubbles and handed out balloons. Hector’s bed lay empty. A member of the board of directors for Medical Missions for Children, Noah Siegal, works in Boston 50 weeks out of the year. This January he traveled to Guatemala to serve patients, many of whom travel long distances to receive surgery. Some will receive it, but others must be sent home if conditions aren’t right for surgery. “Antigua is like Disneyland to the rest of Guatemala,” Siegel said. He believes the “real” Guatemala is in the villages where his patients live. Hector was one of about seven operations the doctors perform in one day, beginning at 7:30 a.m. The doctors in OR#4 trapped Hector’s crying mouth with an anesthesia mask and spread him flat on the table. With a blue felt pen, one doctor marked Hector’s mouth for an incision. Nurses snapped gloves on the doctors’ hands. “It’s like a paint-by-number,” one doctor, wearing a Cleveland Cavaliers cap, said, motioning for another to watch as he made the cut. Registered nurse Malissa Mocsari stepped into OR#4 for her second year in a row. She’s used to working with babies – she’s a labor and delivery nurse at Parkwest Medical Center in Knoxville, Tennessee – but today she checks the charts of a 65-year-old woman: Maria Trinidad Santos. She steps out of the way while Santos calmly glides in on the arm of a nurse. She lays on the table and gazes up at the ceiling as the anesthesiologist straps a mask over her mouth. MARIA TRINIDAD SANTOS WALKS PAST WAITING PATIENTS WITH THE HELP OF HER SON. SHE PAID ONLY 1,000QUETZALES, OR ABOUT $130, TOTAL FOR THE SURGERY. Head doctor, Willard Campbell, chuckles when he hears his patient has had the hernia for 16 years. He removed a man’s 17-year-old hernia yesterday. Exactly 41 minutes after the first incision, the last stitch goes in. Noon sunlight beams in to Obras Sociales del Santo Hermano Pedro Jan. 18. It is less than 24 hours since Knoxville doctor Mike Abadier finished the surgery by sewing Santos’ abdomen back up – a day earlier than she was supposed to be discharged – but she is standing as proud as the flowers her daughter sells in San Antonio. A nurse hands her two packets of pills: Tylenol and ibuprofen. Santos smiles. She still doesn’t know how she’ll pay back her children the 1,000 quetzales for the surgery, but that worry isn’t for today. At least she wouldn’t have to pay for more medication. She touches a hand to her left side as her son leads her down the hospital hallways, past a man in a hospital gown holding an IV pole, away from OR#4, – the same place Hector vacated last week, his lip sewn up – toward the ornate yellow entrance. She sits down in a waiting room chair, takes her silver earrings back from her daughter and slides them back into her earlobes. She isn’t waiting anymore.